Peter "Pete" Seeger (May 3, 1919 – January 27, 2014) was an American folk singer and activist. A fixture on nationwide radio in the 1940s, he also had a string of hit records during the early 1950s as a member of the Weavers, most notably their recording of Lead Belly's "Goodnight, Irene." Seeger and other members of the Weavers were blacklisted during the McCarthy Era. In the 1960s, he re-emerged on the public scene as a prominent singer of protest music in support of international disarmament, civil rights, counterculture, and environmental causes. A prolific songwriter, his best-known songs include "Where Have All the Flowers Gone?" (with Joe Hickerson), "If I Had a Hammer (The Hammer Song)" (with Lee Hays of the Weavers), and "Turn! Turn! Turn!" (lyrics adapted from Ecclesiastes), which have been recorded by many artists both in and outside the folk revival movement and are sung throughout the world. Seeger was one of the folksingers most responsible for popularizing the spiritual "We Shall Overcome" (also recorded by Joan Baez and many other singer-activists) that became the acknowledged anthem of the 1960s American Civil Rights Movement. Beyond songwriting and performing, Seeger used his music to bring about change. He spent his life believing in the power of song to move people to create a better world. 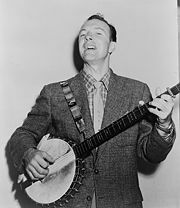 Pete Seeger was born on May 3, 1919 in New York City to Charles and Constance Seeger. His family, which Seeger called "enormously Christian, in the Puritan, Calvinist New England tradition," were also heavily involved in music. A paternal ancestor, Karl Ludwig Seeger, a physician from Württemberg, Germany, had emigrated to America during the American Revolution and married into an old New England family in the 1780s. 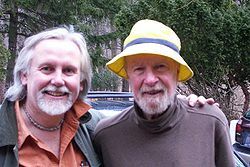 Pete's father, the Harvard-trained composer and musicologist, Charles Louis Seeger, Jr., was born in Mexico City, Mexico, to American parents. Charles established the first musicology curriculum in the U.S. at the University of California in 1913, helped found the American Musicological Society, and was a key founder of the academic discipline of ethnomusicology. Pete's mother, Constance de Clyver (née Edson), raised in Tunisia and trained at the Paris Conservatory of Music, was a concert violinist and later a teacher at the Juilliard School. In 1912, Charles Seeger was hired to establish the music department at the University of California, Berkeley, but was forced to resign in 1918 because of his outspoken pacifism during World War I. Charles and Constance moved back east, making Charles' parents' estate in Patterson, New York, northeast of New York City, their base of operations. When baby Pete was eighteen months old, they set out with him and his two older brothers in a homemade trailer, on a quixotic mission to bring musical uplift to the working people in the American South. Upon their return, Constance taught violin and Charles taught composition at the New York Institute of Musical Art (later Juilliard), whose president, family friend Frank Damrosch, was Constance's adoptive "uncle." Charles also taught part-time at the New School for Social Research. Career and money tensions led to quarrels and reconciliations, but when Charles discovered Constance had opened a secret bank account in her own name, they separated, and Charles took custody of their three sons. Beginning in 1936, Charles held various administrative positions in the federal government's Farm Resettlement program, the WPA's Federal Music Project (1938–1940), and the wartime Pan American Union. After World War II, he taught ethnomusicology at the University of California and Yale University. Charles and Constance divorced when Pete was seven, and in 1932 Charles married his composition student and assistant, Ruth Crawford Seeger, now considered by many to be one of the most important modernist composers of the twentieth century. Deeply interested in folk music, Ruth had contributed musical arrangements to Carl Sandburg's extremely influential folk song anthology the American Songbag (1927) and later created significant original settings for eight of Sandburg's poems. Pete's eldest brother, Charles Seeger III, was a radio astronomer, and his next older brother, John Seeger, taught in the 1950s at the Dalton School in Manhattan and was the principal from 1960 to 1976 at Fieldston Lower School in the Bronx. Pete's uncle, Alan Seeger, a noted poet ("I Have a Rendezvous with Death"), had been one of the first American soldiers to be killed in World War I. All four of Pete's half siblings from his father's second marriage – Margaret (Peggy), Mike, Barbara, and Penelope (Penny) – became folk singers. Peggy Seeger, a well-known performer in her own right, was married for many years to British folk singer and activist Ewan MacColl. Mike Seeger was a founder of the New Lost City Ramblers, one of whose members, John Cohen, married Pete's half-sister Penny—also a talented singer who died young. Barbara Seeger joined her siblings in recording folk songs for children. At four, Seeger was sent away to boarding school, but came home two years later, when his parents learned the school had failed to inform them he had contracted scarlet fever. He attended first and second grades in Nyack, New York, where his mother lived, before entering boarding school in Ridgefield, Connecticut. Despite being classical musicians, his parents did not press him to play an instrument. On his own, the otherwise bookish and withdrawn boy gravitated to the ukulele, becoming adept at entertaining his classmates with it, while laying the basis for his subsequent remarkable audience rapport. At thirteen, Seeger enrolled in the Avon Old Farms prep school in Avon, Connecticut from which he graduated in 1936. During the summer of 1936, while traveling with his father and stepmother, Pete heard the five-string banjo for the first time at the Folk Song and Dance Festival in western North Carolina near Asheville, organized by local folklorist, lecturer, and traditional music performer Bascom Lamar Lunsford, whom Charles Seeger had hired for Farm Resettlement music projects. The festival took place in a covered baseball field. For the Seegers, experiencing the beauty of this music firsthand was a "conversion experience." Pete was deeply affected and, after learning basic strokes from Lunsford, spent much of the next four years trying to master the five-string banjo. The teenage Seeger also sometimes accompanied his parents to regular Saturday evening gatherings at the Greenwich Village loft of painter and art teacher Thomas Hart Benton and his wife Rita. Benton, a lover of Americana, played "Cindy" and "Old Joe Clark" with his students Charlie and Jackson Pollock; friends from the "hillbilly" recording industry; as well as avant-garde composers Carl Ruggles and Henry Cowell. It was at one of Benton's parties that Pete heard "John Henry" for the first time. Seeger enrolled at Harvard College on a partial scholarship, but as he became increasingly involved with politics and folk music, his grades suffered and he lost his scholarship. He dropped out of college in 1938. In 1943, Pete married Toshi-Aline Ōta, whom he credited with being the support that helped make the rest of his life possible. The couple remained married until Toshi's death in July 2013. Their first child, Peter Ōta Seeger, was born in 1944 and died at six months, while Pete was deployed overseas. Pete never saw him. They went on to have three more children: Daniel (an accomplished photographer and filmmaker), Mika (a potter and muralist), and Tinya (a potter), as well as grandchildren Tao (a musician), Cassie (an artist), Kitama Cahill-Jackson (a filmmaker), Moraya (a graduate student married to the NFL player Chris DeGeare), Penny, and Isabelle. Tao is a folk musician in his own right, who sings and plays guitar, banjo, and harmonica with the Mammals. Kitama Jackson is a documentary filmmaker who was associate producer of the PBS documentary Pete Seeger: The Power of Song. Seeger remained engaged politically and maintained an active lifestyle in the Hudson Valley region of New York throughout his life. He and Toshi purchased their land in Beacon, New York in 1949 and lived there first in a trailer, then in a log cabin they built themselves. Toshi died in Beacon on July 9, 2013. Seeger died on January 27, 2014, at the age of 94, at New York's Presbyterian Hospital, where he had been for six days. Family members were with him at the time of his death. His body was cremated. Seeger's first musical gig was leading students in folk singing at the Dalton School, where his aunt was principal. He polished his performance skills during a summer stint of touring New York State with The Vagabond Puppeteers (Jerry Oberwager, 22; Mary Wallace, 22; and Harriet Holtzman, 23), a traveling puppet theater "inspired by rural education campaigns of post-revolutionary Mexico." One of their shows coincided with a strike by dairy farmers. The group reprised its act in October in New York City. That fall Seeger took a job in Washington, D.C., assisting Alan Lomax, a friend of his father's, at the Archive of American Folk Song of the Library of Congress. Seeger's job was to help Lomax sift through commercial "race" and "hillbilly" music and select recordings that best represented American folk music, a project funded by the music division of the Pan American Union (later the Organization of American States), of whose music division his father, Charles Seeger, was head (1938–1953). The resultant 22-page mimeographed "List of American Folk Music on Commercial Recordings," issued in 1940 and mailed by Lomax out to academic folklore scholars, became the basis of Harry Smith's celebrated Anthology of American Folk Music on Folkways Records. 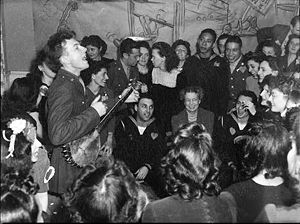 Pete Seeger entertaining Eleanor Roosevelt (center), honored guest at a racially integrated Valentine's Day party marking the opening of a Canteen of the United Federal Labor, CIO, in then-segregated Washington, D.C. Photographed by Joseph Horne for the Office of War Information, 1944. Lomax also encouraged Seeger's folk singing vocation, and Seeger was soon appearing as a regular performer on Alan Lomax and Nicholas Ray's weekly Columbia Broadcasting show Back Where I Come From (1940–1941) alongside Josh White, Burl Ives, Lead Belly, and Woody Guthrie (whom he had first met at Will Geer's Grapes of Wrath benefit concert for migrant workers on March 3, 1940). Back Where I Come From was unique in having a racially integrated cast, which made news when it performed in March 1941 at a command performance at the White House organized by Eleanor Roosevelt called "An Evening of Songs for American Soldiers," before an audience that included the Secretaries of War, Treasury, and the Navy, among other notables. The show was a success but was not picked up by commercial sponsors for nationwide broadcasting because of its integrated cast. During World War II, Seeger also performed on nationwide radio broadcasts by Norman Corwin. In 1936, at the age of 17, Pete Seeger joined the Young Communist League (YCL), then at the height of its popularity and influence. In 1942 he became a member of the Communist Party USA (CPUSA) itself, but left in 1949 after becoming disillusioned by the cruelty of Stalin. In the spring of 1941, the twenty-one-year-old Seeger performed as a member of the Almanac Singers along with Millard Lampell, Cisco Houston, Woody Guthrie, Butch and Bess Lomax Hawes, and Lee Hays. Seeger and the Almanacs cut several albums of 78s on Keynote and other labels, Songs for John Doe (recorded in late February or March and released in May 1941), the Talking Union, and an album each of sea chanteys and pioneer songs. Written by Millard Lampell, Songs for John Doe was performed by Lampell, Seeger, and Hays, joined by Josh White and Sam Gary. It contained lines such as, "It wouldn't be much thrill to die for Du Pont in Brazil," that were sharply critical of Roosevelt's unprecedented peacetime draft (enacted in September 1940). A June 16, 1941, review in Time magazine, which under its owner, Henry Luce, had become very interventionist, denounced the Almanacs' John Doe, accusing it of scrupulously echoing what it called "the mendacious Moscow tune" that "Franklin Roosevelt is leading an unwilling people into a J. P. Morgan war." Eleanor Roosevelt, a fan of folk music, reportedly found the album "in bad taste," though President Roosevelt, when the album was shown to him, merely observed, correctly as it turned out, that few people would ever hear it. More alarmist was the reaction of eminent German-born Harvard Professor of Government Carl Joachim Friedrich, an adviser on domestic propaganda to the United States military. In a review in the June 1941 Atlantic Monthly, entitled "The Poison in Our System," he pronounced Songs for John Doe "strictly subversive and illegal ... whether Communist or Nazi financed," and "a matter for the attorney general," observing further that "mere" legal "suppression" would not be sufficient to counteract this type of populist poison. At that point, the U.S. had not yet entered the war but was energetically re-arming. African Americans were barred from working in defense plants, a situation that greatly angered both African Americans and white progressives. Civil rights leader A. J. Muste and Black union leaders A. Philip Randolph and Bayard Rustin began planning a march on Washington to protest racial discrimination in war industries and to urge desegregation of the armed forces. The march, which many regard as the first manifestation of the Civil Rights Movement, was canceled after President Roosevelt issued Executive Order 8802 (The Fair Employment Act) of June 25, 1941, barring discrimination in hiring by companies holding federal contracts for defense work. Roosevelt's order came three days after Hitler broke the non-aggression pact and invaded the Soviet Union, at which time the Communist Party quickly directed its members to get behind the draft and forbade participation in strikes for the duration of the war (angering some leftists). Copies of Songs for John Doe were removed from sale, and the remaining inventory destroyed, though a few copies may exist in the hands of private collectors. The Almanac Singers' Talking Union album, on the other hand, was reissued as an LP by Folkways (FH 5285A) in 1955 and is still available. The following year the Almanacs issued Dear Mr. President, an album in support of Roosevelt and the war effort. The title song, "Dear Mr. President," was a solo by Pete Seeger. Seeger served in the U.S. Army in the Pacific. He was trained as an airplane mechanic, but was reassigned to entertain the American troops with music. Later, when people asked him what he did in the war, he always answered "I strummed my banjo." Seeger had been a fervent supporter of the Republican forces in the Spanish Civil War. In 1943, with Tom Glazer and Bess and Baldwin Hawes, he recorded an album of 78s called Songs of the Lincoln Battalion on Moe Asch's Stinson label. This included such songs as "There's a Valley in Spain called Jarama," and "Viva la Quince Brigada." In 1960, this collection was re-issued by Moe Asch as one side of a Folkways LP called Songs of the Lincoln and International Brigades. On the other side was a reissue of the legendary Six Songs for Democracy (originally recorded in Barcelona in 1938 while bombs were falling), performed by Ernst Busch and a chorus of members of the Thälmann Battalion, made up of refugees from Nazi Germany. The songs were: "Moorsoldaten" ("Peat Bog Soldiers", composed by political prisoners of German concentration camps), "Die Thaelmann-Kolonne," "Hans Beimler," "Das Lied Von Der Einheitsfront" ("Song of The United Front" by Hanns Eisler and Bertolt Brecht), "Der Internationalen Brigaden" ("Song Of The International Brigades"), and "Los cuatro generales" ("The Four Generals," known in English as "The Four Insurgent Generals"). As a self-described "split tenor" (between an alto and a tenor), Pete Seeger was a founding member of two highly influential folk groups: The Almanac Singers and the Weavers. The Almanac Singers, which Seeger co-founded in 1941 with Millard Lampell and Arkansas singer and activist Lee Hays, was a topical group, designed to function as a singing newspaper promoting the industrial unionization movement, racial and religious inclusion, and other progressive causes. Its personnel included, at various times: Woody Guthrie, Bess Lomax Hawes, Sis Cunningham, Josh White, and Sam Gary. As a controversial Almanac singer, the 21-year-old Seeger performed under the stage name "Pete Bowers" to avoid compromising his father's government career. In 1950, the Almanacs were reconstituted as the Weavers, named after the title of an 1892 play by Gerhart Hauptmann about a workers' strike (which contained the lines, "We'll stand it no more, come what may!"). Besides Pete Seeger (performing under his own name), members of the Weavers included charter Almanac member Lee Hays, Ronnie Gilbert and Fred Hellerman; later Frank Hamilton, Erik Darling and Bernie Krause serially took Seeger's place. In the atmosphere of the 1950s red scare, the Weavers' repertoire had to be less overtly topical than that of the Almanacs had been, and its progressive message was couched in indirect language—arguably rendering it even more powerful. The Weavers on occasion performed in tuxedos (unlike the Almanacs, who had dressed informally) and their managers refused to let them perform at political venues. The Weavers' string of major hits began with "On Top of Old Smoky" and an arrangement of Lead Belly's signature waltz, "Goodnight, Irene," which topped the charts for 13 weeks in 1950 and was covered by many other pop singers. On the flip side of "Irene" was the Israeli song "Tzena, Tzena, Tzena." Other Weaver hits included "Dusty Old Dust" ("So Long It's Been Good to Know You" by Woody Guthrie), "Kisses Sweeter Than Wine" (by Hays, Seeger, and Lead Belly) and the South African Zulu song by Solomon Linda, "Wimoweh" (about Shaka), among others. The Weavers' performing career was abruptly derailed in 1953 at the peak of their popularity when blacklisting prompted radio stations to refuse to play their records and all their bookings were canceled. They briefly returned to the stage, however, at a sold-out reunion at Carnegie Hall in 1955 and in a subsequent reunion tour, which produced a hit version of Merle Travis' "Sixteen Tons" as well as albums of their concert performances. "Kumbaya," a Gullah black spiritual dating from slavery days, was also introduced to wide audiences by Pete Seeger and the Weavers (in 1959), becoming a staple of Boy and Girl Scout campfires. In 1948, Seeger wrote the first version of his now-classic How to Play the Five-String Banjo, a book that many banjo players credit with starting them off on the instrument. He went on to invent the Long Neck or Seeger banjo. This instrument is three frets longer than a typical banjo, is slightly longer than a bass guitar at 25 frets, and is tuned a minor third lower than the normal 5-string banjo. Hitherto strictly limited to the Appalachian region, the five-string banjo became known nationwide as the American folk instrument par excellence, largely thanks to Seeger's championing of and improvements to it. According to an unnamed musician quoted in David King Dunaway's biography, "by nesting a resonant chord between two precise notes, a melody note and a chiming note on the fifth string," Pete Seeger "gentrified" the more percussive traditional Appalachian "frailing" style, "with its vigorous hammering of the forearm and its percussive rapping of the fingernail on the banjo head." Although what Dunaway's informant describes is the age-old droned frailing style, the implication is that Seeger made this more acceptable to mass audiences by omitting some of its percussive complexities, while presumably still preserving the characteristic driving rhythmic quality associated with the style. From the late 1950s on, Seeger also accompanied himself on the 12-string guitar, an instrument of Mexican origin that had been associated with Lead Belly. Seeger's distinctive custom-made guitars had a triangular soundhole. In 1956, then "Peter" Seeger (see film credits) and his wife, Toshi, traveled to Port of Spain, Trinidad, to seek out information on the steelpan, steel drum or "Ping-Pong" as it was sometimes called. The two searched out a local panyard director Isaiah, and proceeded to film the construction, tuning and playing of the then new, national instrument of Trinidad-Tobago. He was attempting to include the unique flavor of the steel pan into America Folk music. In the 1950s and, indeed, consistently throughout his life, Seeger continued his support of civil and labor rights, racial equality, international understanding, and anti-militarism (all of which had characterized the Wallace campaign) and he continued to believe that songs could help people achieve these goals. With the ever-growing revelations of Joseph Stalin's atrocities and the Hungarian Revolution of 1956, however, he became increasingly disillusioned with Soviet Communism. He left the CPUSA in 1949 but remained friends with some who did not leave. On August 18, 1955, Seeger was subpoenaed to testify before the House Un-American Activities Committee (HUAC). Alone among the many witnesses after the 1950 conviction and imprisonment of the Hollywood Ten for contempt of Congress, Seeger refused to plead the Fifth Amendment (which would have asserted that his testimony might be self incriminating) and instead, as the Hollywood Ten had done, refused to name personal and political associations on the grounds that this would violate his First Amendment rights: "I am not going to answer any questions as to my association, my philosophical or religious beliefs or my political beliefs, or how I voted in any election, or any of these private affairs. I think these are very improper questions for any American to be asked, especially under such compulsion as this." Seeger's refusal to answer questions that violated his fundamental Constitutional rights led to a March 26, 1957, indictment for contempt of Congress; for some years, he had to keep the federal government apprised of where he was going any time he left the Southern District of New York. He was convicted in a jury trial of contempt of Congress in March 1961, and sentenced to ten 1-year terms in jail (to be served simultaneously), but in May 1962 an appeals court ruled the indictment to be flawed and overturned his conviction. To earn money during the blacklist period of the late 1950s and early 1960s, Seeger worked as a music teacher in schools and summer camps, and traveled the college campus circuit. He also recorded as many as five albums a year for Moe Asch's Folkways Records label. As the nuclear disarmament movement picked up steam in the late 1950s and early 1960s, Seeger's anti-war songs, such as, "Where Have All the Flowers Gone?" (co-written with Joe Hickerson), "Turn! Turn! Turn!," adapted from the Book of Ecclesiastes, and "The Bells of Rhymney" by the Welsh poet Idris Davies, gained wide currency. Seeger also was closely associated with the 1960s Civil Rights movement and in 1963 helped organize a landmark Carnegie Hall concert, featuring the youthful Freedom Singers, as a benefit for the Highlander Folk School in Tennessee. This event and Martin Luther King's March on Washington in August of that year brought the Civil Rights anthem "We Shall Overcome" to wide audiences. Folk singer and activist Guy Carawan had introduced the at the founding meeting of the Student Nonviolent Coordinating Committee (SNCC) in 1960. In the PBS American Masters episode "Pete Seeger: The Power of Song," Seeger stated it was he who changed the lyric from the traditional "We will overcome" to the more singable "We shall overcome." By this time, Seeger was a senior figure in the 1960s folk revival centered in Greenwich Village, as a longtime columnist in Sing Out!, the successor to the People's Songs Bulletin, and as a founder of the topical Broadside magazine. To describe the new crop of politically committed folk singers, he coined the phrase "Woody's children," alluding to his associate and traveling companion, Woody Guthrie, who by this time had become a legendary figure. This urban folk-revival movement, a continuation of the activist tradition of the 1930s and 1940s and of People's Songs, used adaptations of traditional tunes and lyrics to effect social change, a practice that goes back to the Industrial Workers of the World or Wobblies' Little Red Song Book, compiled by Swedish-born union organizer Joe Hill (1879–1915). Seeger toured Australia in 1963. His single "Little Boxes," written by Malvina Reynolds, was number one in the nation's Top 40s. That tour sparked a folk boom throughout the country at a time when popular music tastes competed between folk, the surfing craze, and the British rock boom which gave the world the Beatles and The Rolling Stones, among others. He was one of the earliest backers of Bob Dylan and was responsible for urging A&R man John Hammond to produce Dylan's eponymous first album, Bob Dylan on Columbia. He also invited Dylan to perform at the Newport Folk Festival, of which Seeger was a board member. It was reported that Seeger was upset over the amplified sound, complaining that he couldn't hear the words. The long television blacklist of Seeger began to end in the mid-1960s, when he hosted a regionally broadcast, educational, folk-music television show, Rainbow Quest. Among his guests were Johnny Cash, June Carter, Reverend Gary Davis, Mississippi John Hurt, Doc Watson, the Stanley Brothers, Elizabeth Cotten, Patrick Sky, Buffy Sainte-Marie, Tom Paxton, Judy Collins, Donovan, Richard Fariña and Mimi Fariña, Sonny Terry and Brownie McGhee, Mamou Cajun Band, Bernice Johnson Reagon, The Beers Family, Roscoe Holcomb, Malvina Reynolds, and Shawn Phillips. The Smothers Brothers ended Seeger's national blacklisting by broadcasting him singing "Waist Deep in the Big Muddy" on their CBS variety show on February 25, 1968, after his similar performance in September 1967 was censored by CBS. In November 1976, Seeger wrote and recorded the anti-death penalty song "Delbert Tibbs," about the eponymous death-row inmate, who was later exonerated. Seeger wrote the music and selected the words from poems written by Tibbs. At the 1969 Vietnam Moratorium March on Washington, DC, Seeger led 500,000 protesters in singing John Lennon's song "Give Peace a Chance" as they rallied across from the White House. Seeger was involved in the environmental organization Hudson River Sloop Clearwater, which he co-founded in 1966. This organization has worked since then to highlight pollution in the Hudson River and worked to clean it. As part of that effort, the sloop Clearwater was launched in 1969 with its inaugural sail down from Maine to South Street Seaport Museum in New York City, and thence to the Hudson River. The sloop regularly sails the river with volunteer and professional crew members, primarily conducting environmental education programs for school groups. The Great Hudson River Revival (aka Clearwater Festival) is an annual two-day music festival held on the banks of the Hudson at Croton Point Park which grew out of early fundraising concerts arranged by Seeger and friends to raise money to pay for Clearwater's construction. The Clearwater Festival brings Hudson Valley residents together to enjoy music, their cultural heritage, and to foster stewardship of the Hudson River. In 1982, Seeger performed at a benefit concert for Poland's Solidarity resistance movement, his first public expression of his personal dislike of communism in its Soviet form. In the late 1980s Seeger also expressed disapproval of violent revolutions, remarking to an interviewer that he was really in favor of incremental change and that "the most lasting revolutions are those that take place over a period of time." In his autobiography Where Have All the Flowers Gone, Seeger wrote, "Should I apologize for all this? I think so." In a 1995 interview, however, he insisted that "I still call myself a communist, because communism is no more what Russia made of it than Christianity is what the churches make of it." In later years, as the aging Seeger began to garner awards and recognition for his lifelong activism, he also found himself criticized once again for his opinions and associations of the 1930s and 1940s. In 2007, in response to criticism from a former banjo student—historian Ron Radosh, Seeger wrote a song condemning Stalin, "Big Joe Blues." The song was accompanied by a letter to Radosh, in which Seeger stated, "I think you’re right, I should have asked to see the gulags when I was in U.S.S.R [in 1965]." In September 2008, Appleseed Recordings released At 89, Seeger's first studio album in 12 years. On September 29, 2008, the 89-year-old singer-activist, once banned from commercial TV, made a rare national TV appearance on the Late Show with David Letterman, singing "Take It From Dr. King." On January 18, 2009, Seeger joined Bruce Springsteen, grandson Tao Rodríguez-Seeger, and the crowd in singing the Woody Guthrie song "This Land Is Your Land" in the finale of Barack Obama's Inaugural concert in Washington, D.C. The performance was noteworthy for the inclusion of two verses not often included in the song, one about a "private property" sign the narrator cheerfully ignores, and the other making a passing reference to a Depression-era relief office. On May 3, 2009, at the Clearwater Concert, dozens of musicians gathered in New York at Madison Square Garden to celebrate Seeger's 90th birthday (which was later televised on PBS during the summer), ranging from Dave Matthews, John Mellencamp, Billy Bragg, Bruce Springsteen, Tom Morello, Eric Weissberg, Ani DiFranco and Roger McGuinn to Joan Baez, Richie Havens, Joanne Shenandoah, R. Carlos Nakai, Bill Miller, Joseph Fire Crow, Margo Thunderbird, Tom Paxton, Ramblin' Jack Elliott, and Arlo Guthrie. Consistent with Seeger's long-time advocacy for environmental concerns, the proceeds from the event benefited the Clearwater. On September 19, 2009 Pete Seeger made his first appearance at the 52nd Monterey Jazz Festival, which was particularly notable because the festival does not normally feature folk artists. In 2010, still active at the age of 91, Seeger co-wrote and performed the song God's Counting on Me, God's Counting on You with Lorre Wyatt, commenting on the Deepwater Horizon oil spill. On December 14, 2012, Seeger performed, along with Harry Belafonte, Jackson Browne, Common and others, at a concert to bring awareness to the 37-year-long ordeal of Native American Activist Leonard Peltier. The concert was held at the Beacon Theater in New York City. On April 9, 2013, Hachette Audio Books issued an audiobook entitled Pete Seeger: The Storm King; Stories, Narratives, Poems. This two-CD spoken-word work was conceived of and produced by noted percussionist Jeff Haynes and presents Pete Seeger telling the stories of his life against a background of music performed by more than 40 musicians of varied genres. On August 9, 2013, one month widowed, Seeger was in New York City for the 400 year commemoration of the Two Row Wampum Treaty between the Iroquois and the Dutch. On an interview he gave that day to Democracy Now!, Seeger sang I Come and Stand at Every Door as it was also the 68th anniversary of bombing of Nagasaki. Pete Seeger was a prolific songwriter with his best-known songs, such as "Where Have All the Flowers Gone?" (with Joe Hickerson), "If I Had a Hammer (The Hammer Song)" (with Lee Hays of the Weavers), and "Turn! Turn! Turn!" (lyrics adapted from Ecclesiastes), recorded by many artists both in and outside the folk revival movement and continue to be sung throughout the world. "Where Have All the Flowers Gone?" was a hit recording for the Kingston Trio (1962); Marlene Dietrich, who recorded it in English, German, and French (1962); and Johnny Rivers (1965). "If I Had a Hammer" was a hit for Peter, Paul & Mary (1962) and Trini Lopez (1963), while the Byrds had a number one hit with "Turn! Turn! Turn!" in 1965. Bruce Springsteen said of Seeger's passing, "I lost a great friend and a great hero last night, Pete Seeger," before performing "We Shall Overcome" while on tour in South Africa. President Barack Obama noted that Seeger had been called "America's tuning fork" and that he believed in "the power of song" to bring social change. "Over the years, Pete used his voice and his hammer to strike blows for workers' rights and civil rights; world peace and environmental conservation, and he always invited us to sing along. For reminding us where we come from and showing us where we need to go, we will always be grateful to Pete Seeger." The Environmental Protection Agency said after his death that "the incredible work" of Seeger and the Clearwater organization helped make the Hudson River cleaner: "His leadership was extraordinary." A proposal was initiated to name the new bridge across the Hudson planned to replace the Tappan Zee Bridge after Pete Seeger. The Peace Abbey Courage of Conscience Award (2008). for his commitment to peace and social justice as a musician, songwriter, activist, and environmentalist that spans over sixty years. ↑ 1.0 1.1 1.2 1.3 1.4 1.5 1.6 1.7 1.8 David King Dunaway, How Can I Keep From Singing (Villard Books, 2008, ISBN 978-0345506085). ↑ 2.0 2.1 Ann M. Pescatello, Charles Seeger: A Life in American Music (University of Pittsburgh Press, 1992, ISBN 978-0822985426). ↑ Allan M. Winkler, To Everything There is a Season: Pete Seeger and the Power of Song (Oxford University Press, 2009, ISBN 978-0195324815). ↑ 4.0 4.1 4.2 Judith Tick, Ruth Crawford Seeger: a Composer's Search for American Music (Oxford University Press, 2000, ISBN 978-0195137927). ↑ David Lewis, Ruth Crawford Seeger Biography in 600 Words Peggyseeger.com. Retrieved April 16, 2014. ↑ John Seeger Dies at 95 Pete Seeger Appreciation Page, January 18, 2010. Retrieved April 16, 2014. ↑ 7.0 7.1 7.2 7.3 7.4 7.5 Alec Wilkinson, The Protest Singer: An Intimate Portrait of Pete Seeger (New York: Vintage, 2010, ISBN 978-0307390981). 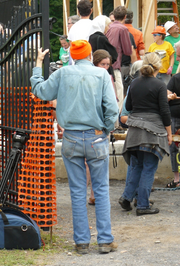 ↑ 8.0 8.1 articles from "July, 2013" Pete Seeger Appreciation Page. Retrieved April 16, 2014. ↑ "Renowned folk singer and activist Pete Seeger (1919-2014) is a longtime Unitarian Universalist." Unitarian Universalist website. Retrieved April 16, 2014. ↑ Wendy Schuman, Pete Seeger's Session Beliefnet. Retrieved April 16, 2014. ↑ Lawrence Emery, "Interesting Summer: Young Puppeteers in Unique Tour of Rural Areas," Daily Worker, October 2, 1939. Retrieved April 17, 2014. ↑ Folk Songs in the White House, Time, March 3, 1941. Retrieved April 17, 2014. ↑ "The Poison in Our System" (excerpt from the Atlantic Monthly) by Carl Joachim Friedrich. Retrieved April 23, 2014. ↑ Testimony of Pete Seeger before the House Un-American Activities Committee, August 18, 1955 History Matters. Retrieved April 25, 2014. ↑ United States v. Seeger, 303 F. 2d 478 (2d Cir. 1962). Retrieved April 25, 2014. ↑ Raquel Maria Dillon, School board offers apology to singer Pete Seeger Associated Press, February 11, 2009. Retrieved April 25, 2014. ↑ Bruce Jackson, The Story Is True: The Art and Meaning of Telling Stories (Philadelphia, PA: Temple University Press, 2008, ISBN 978-1592136070). ↑ David Bianculli, Dangerously Funny: The Uncensored Story of the Smothers Brothers Comedy Hour (Touchstone, 2010, ISBN 1439101175). ↑ Helen King, Songwriter – Pete Seeger and Writing For Freedom Songwriting Magazine, November 1976. Retrieved April 25, 2014. ↑ Pete Seeger, How "Waist Deep in the Big Muddy" Finally Got on Network Television in 1968 From Give Peace a Chance, An 1983 Exhibit at the Peace Museum in Chicago, Peteseeger.net, May 1983. Retrieved April 25, 2014. ↑ Smothers Brothers Comedy Hour, CBS, Season 2, Episode 24, February 25, 1968. ↑ Clearwater Retrieved April 25, 2014. ↑ Pete Seeger, Where Have All the Flowers Gone: A Musical Autobiography, (Norton, 2009, ISBN 978-0393338614). ↑ The Old Left New York Times Magazine, January 22, 1995. Retrieved April 28, 2014. ↑ Nicholas Wapshott, Seeger turns on Uncle Joe, New Statesman, September 27, 2007. Retrieved April 28, 2014. ↑ "How Can I Keep from Singing? ": A Seeger Family Tribute. 2007 symposium and concert, American Folklife Center, Library of Congress. Retrieved April 17, 2014. ↑ Maria Puente and Elysa Gardner, Inauguration opening concert celebrates art of the possible, USA Today, January 19, 2009. Retrieved April 17, 2014. ↑ Tommy Stevenson, "This Land Is Your Land" Like Woody Wrote It, Truthout, January 19, 2009. Retrieved April 17, 2014. ↑ Hudson River Sloop Clearwater Clearwater.org. Retrieved April 16, 2014. ↑ Patrick Doyle, Video: Pete Seeger Debuts New BP Protest Song Rolling Stone, July 26, 2010. Retrieved April 17, 2014. ↑ Simon Moya-Smith, Celebrity Activists Harry Belafonte, Pete Seeger, Common and Michael Moore Come Together for Leonard Peltier Indian Country Today Media Network, April 23, 2013. Retrieved April 17, 2014. ↑ Hachette Book Group, HACHETTE AUDIO AND JEFF HAYNES INTRODUCE PETE SEEGER: THE STORM KING▪ STORIES, NARRATIVES,POEMS: Seeger's Spoken Word Set to All New Multi-Genre Music Retrieved April 17, 2014. ↑ Pete Seeger & Onondaga Leader Oren Lyons on Fracking, Indigenous Struggles and Hiroshima Bombing Democracy Now!, August 9, 2013. Retrieved April 17, 2014. ↑ Pete Seeger – This Land is Your Land (Live at Farm Aid 2013) YouTube. Retrieved April 17, 2014. ↑ David Jackson, Obama memorializes Pete Seeger USA Today, January 28, 2014. Retrieved April 15, 2014. ↑ 36.0 36.1 Gerry Harrington, Movement afoot to name bridge after Pete Seeger UPI, January 31, 2014. Retrieved April 25, 2014. ↑ Pete Seeger Songwriters Hall of Fame. Retrieved April 15, 2014. ↑ Eugene V. Debs Award Program Eugene V. Debs Foundation. Retrieved April 15, 2014. ↑ The Letelier-Moffitt Human Rights Awards Retrieved April 15, 2014. ↑ Grammy Lifetime Achievement Awards Grammy.org. Retrieved April 15, 2014. ↑ Pete Seeger - 1994 National Medal of Arts Recipient National Medal of Arts. Retrieved April 15, 2014. ↑ Pete Seeger The Kennedy Center. Retrieved April 15, 2014. ↑ Pete Seeger To Receive Harvard Arts Medal The Harvard University Gazette, February 29, 1996. Retrieved April 15, 2014. ↑ The James Smithson Bicentennial Medal Smithsonian Institute. Retrieved April 15, 2014. ↑ Pete Seeger Rock and Roll Hall of Fame. Retrieved April 15, 2014. ↑ 46.0 46.1 46.2 Past Winners Search Grammy.com. Retrieved April 15, 2014. ↑ Schneider Family Book Award recipients named American Library Association, January 22, 2007. Retrieved April 15, 2014. ↑ Courage of Conscience Award Winners Retrieved April 15, 2014. 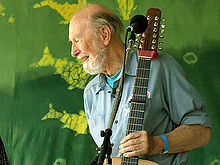 ↑ Folk icon Pete Seeger inspires boatload of fun Daily News, September 7, 2009. Retrieved April 15, 2014. ↑ Recipients of the George Peabody Medal for Outstanding Contributions to Music in America Peabody Institute. Retrieved April 15, 2014. ↑ 56th Annual GRAMMY Awards Winners & Nominees: Best Spoken Word Album. Grammy.com. Retrieved April 15, 2014. ↑ Pete Seeger Discography www.discogs.com. Retrieved April 15, 2014. ↑ Discography for Pete Seeger on Folkways Folkways.si.edu. Retrieved April 15, 2014. Forbes, Linda C. "Pete Seeger on Environmental Advocacy, Organizing, and Education in the Hudson River Valley: An Interview with the Folk Music Legend, Author and Storyteller, Political and Environmental Activist, and Grassroots Organizer." Organization & Environment, 17(4) (2004): 513–522. Gardner, Elysa. "Seeger: A 'Power' in music, politics." USA Today, February 27, 2008. Wilkinson, Alec. "The Protest Singer: Pete Seeger and American folk music," The New Yorker, April 17, 2006, 44–53. Retrieved April 15, 2014. Pete Seeger - The Power of Song American Masters, PBS. Pete Seeger Find A Grave. This page was last modified on 14 March 2019, at 16:14.